One person can make a difference. Nineteen-year-old B.J. Viau founded the Twin Cities Shoot for a Cure Huntington’s Disease Hoop-A-Thon. This basketball fundraiser, which is in its ninth year, benefits medical research towards finding a cure for Huntington’s Disease, and it promises to be a success. Huntington’s is a hereditary disorder resulting in a slow and permanent loss of both psychological and physical competence. Viau’s fundraising event has grown each year. Shooters are given five minutes to sink as many shots as possible. Contributions can come in the shape of flat rate pledges but are often contingent on the number of baskets made by a sponsored shooter. The event is only for basketball enthusiasts, Viau said, and participants in the fundraiser are allowed to stand as close to the basket as they like. The hoop-a-thon has raised close to $300,000 in eight years for Huntington’s Disease, which affects more than 30,000 Americans. A hoop-a-thon is a great fundraising idea, and you can make it even better by having basketball stars on hand for pictures with contestants and to give out prizes and medals. For large competitions, serve refreshments and maybe even hire a band to perform at the event. The competition itself can be based upon individual shooting efforts or by organizing teams. If using the team approach, have teams of four or five, and give each team three ten-minute rounds to sink as many free throws as they can. 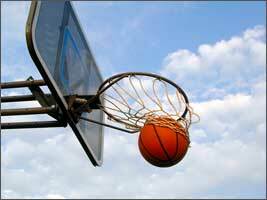 Sponsors can pledge a small amount per free throw and per three point shot, or they can make a flat donation. Have pledge forms handy for late arriving supporters who are interested in donating. To add excitement and increase participation, award prizes to top performers for both shooting and fundraising, such as for most baskets made and most funds collected. As an example, the top fundraising person or team could win tickets to an NBA basketball game, and you may be able to arrange to have them recognized at half time.